In stock 12 volt 2 amp regulated ROHS approved UL switching power supply, 5.5x2.1mm barrel connector, 110V to 12V from PowerStream. This inexpensive, highest quality, 12 volt AC/DC ROHS grade switching power supply adapter is useful for any application, including those requiring ROHS or Energy Star 12 volts at 2 amps continuous. UL, cUL, TUV. 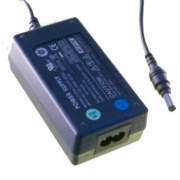 For 60 Watt to 120 Watt AC Laptop Adapters for all Manufacturers, click here. Input Connector IEC C7, two prong input socket allows cords for any country to be used, the North American cord is included. 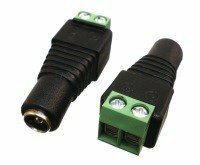 Optional DC Plugs slip over the 5.5 x 2.1 mm connector if needed. Model : PST-F10242 Name : 12V DC Switching Power Supply for ROHS applications.